Jill Haley is an artist devoted to the expression of art through nature…or is it nature through art? She is known worldwide on radio and air play for her work as a solo artist and through her work with Windham Hill Records. 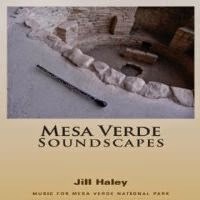 Mesa Verde Soundscapes is her third foray into an album with a national park theme and is dedicated to the personnel that devote their lives to the upkeep of the park. In each of these fourteen original tracks inspired by her trip to the Mesa Verde National Park, elements of the landscape can be found echoing through every note. Joining her in this epic journey are Graham Cullen (cello), Risa Cullen (viola), Dana Cullen (horn), and David Cullen (guitar).With the album, there is a booklet that describes each song and the place it was derived from. “Curves of Burnt Orange” begins with tender piano movements reminiscent of the sun peaking over a large body of rock. It is a peaceful awakening by horn and tender keystrokes. A stretch after a long sleep, or a restful nap in the calm of the afternoon. A cool breeze wafts over you and you look out over nature’s majesty. The curves of the rock are like the sweetly sloping curves of a hip with just a hint of what lies beneath its mysteries. Just when you think it will be a sedate journey, the track flares up with a rousing burst of energy and then is tranquil once more. Nature…ever changing…ever there. Air kissed notes greet us with “Sandstone Angels.” Horn blends with piano, seamlessly capturing the essence of towering spires of nature’s bounty. Miraculous formations rise from the earth, reaching for the glory of the heavens. The sweeping grace of this piece denotes the awe and wonder as you walk through the valley of the artist’s mind marveling at the wonders this song is dedicated to. Beauty walks the land in stone angels and natural wonder. “Mesa Nightfall” is the last track on the album. If you close your eyes, you can see the vast expanse of stars winking in the wide western skies. The landscape fades to shadow and the light sinks low on the horizon. Peace after a day spent among nature’s children, it is now time to rest and await the break of day. Piano movements drift you into slumber, sweet dreams cresting on the wings of night. Jill Haley has a beautiful talent for capturing nature with every note. She and her contributing artists have created a soundscape dedicated to Mesa Verde National Park. We may not get to personally see the wonders of this spectacular locale but the musical descriptions help me to see the magic behind the pictures and the love she has for the land. Mesa Verde Soundscapes is an audible journey via New Age style instrumentals. A palate rich in color and substance, this is an album that should not be missed.